I've never been a big collector of chunky knits, that is until I moved to LA. Even though the weather still hasn't shifted to fall quite yet, my collection of knit sweaters has already doubled in the short time of living here. With the unpredictable weather they've become my best friend. I love the idea of being able to throw a chunky knit over a dress to transition into fall yet, I can still wear it throughout the winter with a couple of extra layers. 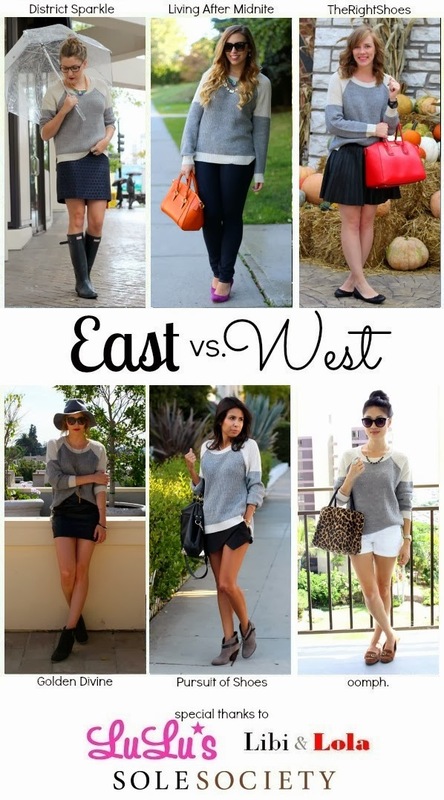 This is the fourth and final East vs. West fall style series, but don't worry we will be back this holiday season with even more so stay tuned. You can find our previous style series where we each styled our favorite fall trends including: the Leopard Print, Leather Detail and Ankle Booties. Love this look! That slouchy sweater is to die for! I think you wore it best. Love that sweater! I love how you styled it because it is something new for you that you normally don't gravitate toward. Grey and black leather always mesh well. we certainly don't need sweaters in hawaii either, but i still love them! great look, and love the hat! Classic styling. Love the necklace. It's a lovely touch to the look. Classic styling. Love the touch with the necklace. Such a cute sweater. Simple and easy - that hat is a great topper! Enter my giveaway for an ILY Couture Graphic Sweatshirt! Love that hat! I need one like that asap!